We sell Meridian products like Rayners Classic Malt Extract - 340g online in the UK and directly from our award-winning store in Scotland. Malt extract can be added to warm water or milk, spread on toast or toast or over cereals or it can be used in baking cakes and biscuits. Try in bread making, in cookies or stir into hot milk for soothing evening drink. Enjoy as part of a varied and balanced diet. Rayners organic barley malt extract is made from English barley. Made using organic British barley. As official Meridian stockist, we sell genuine Sugar & Sweeteners directly from our shop in Scotland and online throughout the UK. Where can you buy real Malt Extract - Classic safely online? If you are wondering where you can buy Rayners Classic Malt Extract - 340g safely online in the UK, then shop with us. We are an actual health foods shop; with real people selling real foods and products. Our award-winning independent shop is located in Stirling, Scotland since 1976. You can buy our Organic Food and other genuine Sugar & Sweeteners in store or safely place an order with us online or over the phone. 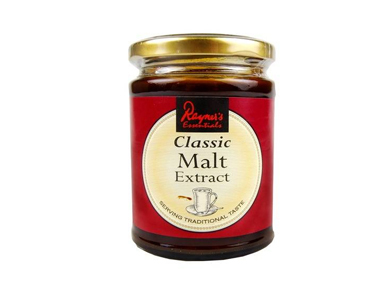 Malt Extract - Classic - Rayners Classic Malt Extract - 340g in Sugar & Sweeteners and Foods.